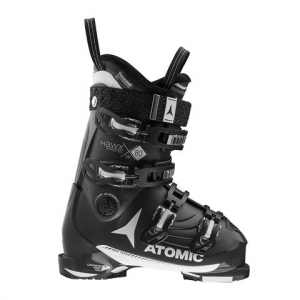 Both the women's and men's versions of the Hawx Prime 80 from Atomic have been the greatest selling boot in our shop for years. This boot is very affordable for the sheer amount of performance enhancing details that it has. Featuring a cozy 3M Thinsulate liner with a wider, more fluted calf for women that need more room without losing any performance, a mid-wide forefoot and near heel pocket, the Hawx Prime 80 has the most accommodating fit out there. With a softer flexing boot made just for women, this is one of the best choices there is for beginner to intermediate skiers and for the price, you just can't beat it.